The Municipality of Killarney will be implementing an alternate method of voting for the 2018 elections. In recent years the Municipality has been using vote by mail but for 2018 we will be implementing Internet and Telephone Voting for the 2018 Municipal Election in October, 2018. This system replaces the traditional polling place method and eliminates the need for advance polls and voting proxies. It also improves voter access and increases voter participation. As the election draws closer we will be including more information about the voting process on this page. In Killarney the Mayor is elected at large, which means all eligible voters choose from the same mayoral candidates when voting. Councillors are elected to represent two wards, three Councillors Ward 1 and two Councillors Ward 2. May 1 – Nomination period commences. July 30 – Certification of nomination papers before 4 p.m. – Acclamations after 4 p.m.
July 31 to September 1 – Receipt of Preliminary List of Electors (PLE) from the Municipal Property Assessment Corporation (MPAC) on a date between July 31 and September 1 of an election year as agreed upon by the clerk and MPAC. - Provide copies of voters’ list to persons entitled. Who will get a Voter Instruction Letter (VIL) with a PIN to vote in the election? All qualified electors on the official Municipal Elector's List provided by the municipality. What if my name is not on the Elector List? Eligible electors who are not on the official Elector List will have to go to a location designated by the Election Official and complete the required form to have their name added to the Elector List. Once this is completed you will be given a VIL by the Election Official. When should I expect to receive my PIN in the mail? A. Individual PINs will be mailed to eligible electors so that they are received approximately three (3) to five (5) days prior to the first voting day. What if I don’t get a PIN in the mail by Election Day? If you are an eligible elector and on the official Elector List, but you did not get a PIN in the mail by the start of the election period, you can request a replacement PIN. If the Election Official’s records indicate you were sent a PIN in the mail then the original PIN will be disabled and cannot be used to cast a vote in the election. A replacement PIN will be issued to you if the original PIN has not been voted and you provide appropriate identification. Why would I not get a PIN in the mail? If you didn’t get a PIN in the mail one of two things may have happened. First, your name was not on the official Elector List. PINs are only mailed to electors whose names appear on the official Elector List as supplied by the municipality. Secondly, a PIN may have been mailed to you and it has been delayed for some reason in the mail system. Can anyone tell how I voted if they know my PIN? No. The system does not track how a particular PIN has voted, only that the PIN has been used to cast a vote. Once I have my PIN, do I have to register in advance if I want to use either the telephone or the Internet to cast my vote? No, there is no registration required. During the election period, using your PIN, you can use either the telephone or the Internet to cast your vote or vote using a paper ballot if this is offered by the municipality. What if I lose or misplace my PIN? If an elector loses or misplaces their PIN they should contact the Voter HelpLine. The Election Official can decide to replace the missing PIN if it has not already been voted. They will determine if a voter has to travel to a location, sign a form, and then replace the missing PIN, or they can decide to allow the Voter HelpLine agent to authenticate the caller and issue a replacement PIN over the phone. In both cases, the original lost or missing PIN will be disabled and it will not be able to be voted in the election. How do I access the voting system? Voting instructions will be included in the Voter Instruction letter mailed to each eligible elector on the official Elector List. Included in this information are instructions on how to access the voting system. Voters can cast their ballot using the telephone or cell phone by calling a toll free number. Voters using personal computers will use the Internet to visit a website that will allow them entry into the voting system where they can cast their vote. Once I enter my PIN and start my voting process do I have to complete all the races on the ballot in one session? For example, what if I am interrupted and have to hang up the phone for some reason or, if I am voting using the Internet and have to leave my session? No, you do not have to vote all the races on your ballot at one time uninterrupted. You can disconnect from the Internet or the telephone and re-connect later, re-enter your PIN, and complete your voting activity at that time. In fact, if you find it more convenient, you can switch from one method to the other and complete your voting using the other method. For example, you can start your voting on the Internet and at some point close your Internet session, and then later re-start the voting process and re-enter your PIN using your phone or cell phone and complete your ballot. What happens if I access the voting system and am presented with incorrect candidates for my district or ward? The list of candidates presented to you as a voter is determined by your place of residence as defined on the Elector List. If you have moved and your new address was not updated on the Elector List, (and your Voter Instruction letter and PIN were forwarded to your new address), then you will see the list of candidates associated with your old place of residence. You should call the Voter HelpLine and the Election Official will authenticate you and, if satisfied, can then electronically “re-categorize” the PIN. The correct list of candidates will be presented to you once you re-connect to the voting system. What do I do if I am not sure if I completed a race or the ballot? During the voting period you can connect to the voting system and enter your PIN. If you have yet to complete all ballots assigned to you, the system will begin where you left off - at the next race you are eligible to complete. When you have completed voting all ballots assigned to you, entering your PIN online in the voting system during the voting period will display a message containing your vote status. This message will advise if you have completed voting. You can also contact the Voter HelpLine to get more information. If I am using the telephone to vote, how will I know what number to press to vote for the candidate of my choice or what if I make a mistake and select a different candidate than the one I want to vote for? The Voter Instruction letter mailed to you has the list of candidates included on it for your reference purpose. In addition, each time the system presents you with a race to vote for; it lists the eligible candidates running for that position and instructs you to select the corresponding number for that candidate. You may also clear your ballot selections and start over. Once a vote has been confirmed, can it be changed? No. Once a vote has been confirmed it cannot be changed. This process is the same as dropping the ballot into the ballot box in a traditional paper based election ensuring complete voter anonymity and secrecy of ballot. The system does not know how the ballot was voted; only that the PIN was used in the election to cast a vote and thus it cannot be removed from the vote count. How do I vote if I am away from home, out of town, out of the province, or out of the country? You can vote during the election voting period using the Internet from anywhere in the world. You can also use telephone service and connect to the voting system toll free from anywhere in North America simply by dialing the toll free number contained in your Voter Instruction letter. What if I have a rotary phone at home, no cell phone and don’t have a computer with Internet service. How can I vote? You do not have to vote from home. You can vote from any location using any phone with touch tone service or from any computer. You can also vote in person at polling stations if the municipality is offering PC’s and phones at these locations and/or paper ballots in concert with the electronic voting options. The location of the polling stations can be found in the Voter Instruction letters sent to eligible electors. If someone calls me and asks for my PIN, what should I do? You should treat your voting PIN with the same level of secrecy and confidentially you reserve for your bank card and PIN. Do not give your PIN to anyone who may call or approach you for the number. What do I do if the phone line is busy when I call and try to vote? If the phone lines are busy, simply hang up and call back a short time later. The voting system is capable of handling a significant volume of calls simultaneously but there is always the possibility that many voters are attempting to call in the same timeframe. Voters will be able to connect to the system over the course of a number of days during the voting period. Could someone steal my PIN and vote with it? Stealing and opening another person’s mail is illegal. It is also illegal to represent yourself as another person and steal their right to vote in an election. Both these acts are illegal and have penalties defined by law. If you know someone has voted your PIN illegally you should report it to the Election Official. You can obtain a replacement PIN to cast your vote by presenting yourself to the Election Official and swearing an affidavit that the PIN assigned to you was not voted by you but by someone else. If I am a voter with a disability; deafness, blindness, or a mobility disability, can someone help me with the voting process? Electronic voting allows increased rights of privacy to voters with physical challenges that make traditional voting at polling stations more difficult. Blind voters can make use of the telephone and deaf voters can use the Internet to vote with little or no assistance required from others. If you need assistance at the polling station to cast your vote, the Election Official present will be able to assist you. Would it be possible for me to be sent more than one PIN? If you received more than one PIN it is because your name appeared on the Elector List more than once. This rare situation might occur if you changed your place of residence and have been enumerated in both locations or you own property and are the registered resident at both locations. You are only permitted to vote once in a municipality and you should only cast a vote using the PIN associated with your primary place of residence. Notify the Election Official of the additional PIN and they will disable this PIN rendering it unusable for the election. Notice is hereby given to the Municipal Electors of the MUNICIPALITY OF KILLARNEY that nominations for the offices of Mayor and Councillor may be made by completing and filing, in the office of the Clerk, nominations in the prescribed form. A person can only become a candidate during the Nomination Period. The Nomination Period starts on Tuesday May 1, 2018 and ends on Friday July 27, 2018 at 2:00 pm. Nomination papers will not be accepted after the deadline. Nomination papers must be signed by the candidate and filed in person or by an agent (no fax or email) during regular business hours. The Endorsement of Nomination form requiring 25 signatures is not necessary as eligible voters in the Municipality of Killarney total less than 4,000. Tuesday May 1, 2018 through to Thursday July 26, 2018, Monday to Friday (statutory holidays excepted) between 9:00 am to Noon and 1:00 pm to 4:30 pm. Friday July 27, 2018 (Nomination Day) between 9:00 am and 2:00 pm. On Nomination Day, candidates must make their presence known to the Clerk prior to 2:00 pm. Nomination papers will not be accepted after the deadline. Nominations may be made by completing and filing, in the office of the Clerk, the prescribed nomination form along with acceptable identification (must be valid and contain the candidate’s name, a photo I.D., qualifying address and signature), the prescribed nomination filing fee ($200 for the Office of Mayor, $100 for all other offices), and such other documentation as required for the filing process. The filing fee is payable by cash, debit, credit card (VISA or Mastercard only), certified cheque or money order made payable to The Municipality of Killarney. If, after having filed a nomination form, a candidate wishes to file a nomination for a different office in the same election, the first nomination shall be deemed to have been withdrawn at the time the second nomination is filed. The filing fee is deemed to have been paid with the latest filing if the two nominations are for the same council/board unless changing offices. If a greater number of candidates are certified than are required to fill the said office, there will be an election. If the number of nominations for an office is less than the number of candidates to be elected an additional Notice of Nomination will be advertised with postings on the Municipal office bulletin boards as well as on the website. Additional nominations may be filed only between 9:00 am and 2:00 pm on the Wednesday following Nomination Day (August 1, 2018) in the office of the Clerk. New in the 2018 Municipal Election – Voters in the Municipality of Killarney will be voting electronically, by internet or telephone. Prior to September 1, 2018, the Municipal Property Assessment Corporation (MPAC) will provide the Municipality of Killarney with the Preliminary List of Electors (PLE). The Clerk then corrects and amends the PLE using information held by the municipality and produces the Voters’ List by September 1, 2018. The Municipal Property Assessment Corporation (MPAC) has created a website to offer citizens the opportunity to ensure they are on the list. If you are an Ontario resident over the age of 18 you can visit voterlookup.ca to confirm or update your information in a few easy steps. You can also change your school support for electoral purposes. Go to the Voter Information tab to locate the Voter Lookup link. Updating this information will help to ensure that the municipal Voters’ List is accurate and up-to-date in preparation for the municipal and school board elections. During the Revision Period, electors may make application to be added to, or amend, their information on the Voters’ List up to, and including, Voting Day. Electors can complete an Application to Amend the Voters’ List (Form EL-15) and the elector will then be required to attend the office with the necessary identification to sign the application. Electors may also make application to amend the Voters’ List by attending the Municipal Office during regular business hours (Monday to Friday from 9:00 a.m. to 4:30 p.m.). On Voting Day (October 22, 2018) electors may make application to amend the Voters’ List up to 8:00 p.m. The Clerk will require proof of identification. For individuals who cannot provide the required identification, a Declaration of Identity (Form 9) may be completed. Authorized Election Officials will be managing and updating the Voters’ List on an ongoing basis. The voting period shall commence on Tuesday, October 9, 2018 at 10:00 a.m. through until 8:00 p.m. on Monday, October 22, 2018. During the voting period, the Municipal Office is designated as the Voter Help Centre and will host access to the internet through a voting station with applicable voting equipment. Every Canadian citizen has the right to vote. It is how Canadians choose which leaders represent them. Voting is a responsibility that all Canadians should exercise. Your community is shaped by the outcome of an Election. Voting connects citizens with the political process and with each other. When you take part in an election and express your view, you make democracy work. In the next election, Killarney electors will vote to elect their Mayor, Councillors and School Board Trustees. Voting for a Mayor and your ward Councillors gives you a say in the direction the Town of Killarney will take. If a person has no other permanent lodging place, the place where he or she occupies a room or part of a room as a regular lodger to which he or she habitually returns is his or her residence. A resident elector is where a person lives and is eligible to vote in that municipality's election. A person is only allowed to have one residence. If a person lives in one municipality, but owns or rents property in another municipality, then they are a non-resident elector and able to vote in that municipality's election. If a person lives in one municipality, and qualifies as a spouse of a non-resident elector, then they are able to vote in that municipality's election. The place to which the person most frequently returned to sleep or eat during the five weeks preceding the determination is his or her residence. If the person returns with equal frequency to one place to sleep and to another to eat, the place to which he or she returns to sleep is his or her residence. Multiple returns to the same place during a single day, whether to eat or to sleep shall be considered one return. A person's affidavit regarding the places to which he or she returned to eat or sleep during a given time period is conclusive, in the absence of evidence to the contrary. A person may have residences in two local municipalities at the same time if the person lives in one of the local municipalities in order to attend an education institution, but not with the intention of changing his or her permanent lodging place, and the person's permanent lodging place is in the other local municipality. This means that students are able to vote in the municipality where they attend school and also in the municipality where they live. A person who was convicted of a corrupt practice described in Section 90 (3) of the MEA, if voting day in the current election is less than five years after voting day in the election in respect of which he or she was convicted. Voters must be Roman Catholic and be otherwise qualified as electors to be separate school electors. Voters must have French Language Education Rights to be supporters for French language school board. Non-resident owners or tenants, or spouses of owners or tenants of commercially and industrially assessed lands are not eligible to vote for school board purposes. English-language public school board is the default for a voter unless they are qualified to be a separate or French school board supporter. 'Supporter' means which school board the school portion of the property taxes goes to. A voter is only entitled to vote once in a municipality and once in a school board, even if the voter has more than one qualifying property address within the municipality or school board. The place where they vote is where they reside. In a municipality with wards, if a voter resides in one ward but has other properties in different wards in the same municipality, he or she may only vote in the ward where he or she resides. A voter may only have one permanent residence. Only Internet/Telephone Voting shall be used for the 2018 Municipal Election. Internet voting allows an elector to cast an electronic ballot from their personal computer, tablet or smartphone from anywhere there is an internet connection (cable, Wi-Fi or cellular). Alternatively, votes can also be cast by telephone within North America and a toll-free line will be set up by the eVoting Service Provider. Voter information Letters (VILs) will be printed through the municipality’s contracts with Intelivote and DataFix using the Voters’ List, as amended and delivered through Canada Post to the mailing address of all eligible voters in advance of the voting period. In the case of an emergency, or at the discretion of the Clerk, alternative delivery methods may be utilized. Information on illegal and corrupt practices under the MEA. A person cannot give their VIL to another eligible elector for the purpose of voting. Acceptance of another person’s VIL, including the actual voting thereof, will be considered an illegal and corrupt practice, and therefore, subject to the penalty provision under the MEA, specifically s.89 and 90. Should an eligible voter receive more than one VIL, the eligible voter may only vote once and must return the other VIL to the Municipal Office. Electors who knowingly vote twice are committing an offence under the MEA and subject to an investigation and prosecution by the police and legal system. VILs returned to the Municipal Office shall have the PIN disabled. The VIL will be maintained in a secure fashion and destroyed in the same manner as all other municipal election material. If an elector on the Voters’ List has lost/not received their VIL and the PIN has not been used, an authorized Election Official can provide a new VIL and PIN provided that satisfactory information has been provided and the elector completes the necessary forms. The authorized Election Official will proceed to disable the elector’s first assigned PIN and issue a new VIL and PIN. Where a person on the Voters’ List has attempted to vote and their PIN has already been used, they can attend the Municipal Office and prove to the satisfaction of the Municipal Clerk that they did not vote the PIN and require a new PIN. Upon providing proof of identity and residence a new Voter Information Letter containing a new PIN may be issued provided the required statutory declaration has been executed. This process may require engagement of law enforcement. Where an eligible voter has received an incorrect PIN in terms of ward and/or school support and has not voted, they can contact the Voter Help Centre and may have the proper category applied to the existing PIN. The elector will be required to provide appropriate confirmation of eligibility. The following is a list of acceptable identification. Since the adoption of Ontario Regulation 304/13, there is only ONE list and only ONE item of acceptable identification is required. That ONE item must be an original and shall show the person’s name and qualifying address. The list of acceptable identification may be found here. Are you thinking about running in the 2018 Municipal Election? Date: Tuesday, July 17th, 2018 at 6:30 p.m. The Ministry of Municipal Affairs will be presenting an overview of municipal election information and legislation followed by a ‘Question and Answer’ period. There have been many changes in the Municipal Elections Act since 2014, this session is a great opportunity to gain better understanding of how the municipal election works, the roles and responsibilities of candidates and third party advertisers, what you can expect if elected and the roles and responsibilities of elected officials and staff. Staff from the hosting Municipalities will also be present and available to answer questions. This information session is open to candidates, potential candidates and the general public. Nominations can be filed with the Clerk during regular Town of Killarney municipal office hours (9:00 a.m. – 12:00 Noon and 1:00 pm – 4:00 p.m.) from May 1, 2018 to July 26, 2018. Nominations can be filed on Nomination Day (July 27, 2018) between 9:00 a.m. and 2:00 p.m. Here you will find Municipal Election forms. Further items will be added as they become available. Is not prohibited from voting as noted or otherwise, by law. Not disqualified for violation of financial requirements or violations of requirements for filing financial information. Not disqualified by any Act from holding such office. Not disqualified under the provisions as outlined in MEA s.90(2) and 91(1). Except in accordance with MEA, s.30 (Leave of Absence), an employee of the municipality or a person who is not an employee of the municipality, but who is the Clerk, Treasurer, Integrity Commissioner, Auditor General, Ombudsman or registrar referred to in s.223.11 of the Municipal Act or an investigator referred to in s.239.2(1) of the municipality or a person who is not an employee of the municipality, but who holds any administrative position of the municipality. A judge of any court. A Senator, a Member of Parliament, a Member of Provincial Parliament. A person who is serving a sentence of imprisonment in a penal or correctional institution, including a sentence being served in the evening or on weekends (this does not include a person serving a sentence at home). A person acting as executor or trustee or in any other representative capacity. A person who was convicted of the corrupt practices described in MEA, s.90(3) if Voting Day in the current election is less than 5 years after Voting Day in the election in respect of which he or she was convicted. So You Want to Run for Council? A list of non-certified nomination papers filed will be posted on www.municipalityofkillarney.ca as soon as possible after filing. Under the MEA, the Clerk is required to reject or certify nominations of candidates. Therefore, on July 30, 2018 before 4:00 p.m. the Clerk will examine each nomination filed and, if satisfied the person is qualified to be nominated and that the nomination complies with the MEA, the Clerk shall certify the nomination form. The mandatory financial statement from a previous election was not filed. There may be other circumstances in which the candidate is disqualified from being nominated or elected other than those identified above. It is the responsibility of each candidate to ensure that they are not disqualified from being nominated for the office. If not satisfied, the Clerk will reject the nomination and, as soon as possible, give notice to the person who sought to be nominated and to all other candidates for that office. The Clerk’s decision to certify or reject a nomination is final. Once the nomination is certified, the candidate’s name will be placed on the ballot unless the name is removed by a Court Order. A list of certified candidates will be posted on www.municipalityofkillarney.ca as soon as possible after certification. A candidate may withdraw their nomination by completing a Withdrawal of Nomination form and filing it in the Clerk’s Office on or before 2:00 p.m. on July 27, 2018. If the withdrawal is completed by an agent, a copy of the candidate’s photo identification must accompany the written notice. The Clerk will contact the candidate for confirmation. If withdrawing, the candidate is entitled to a refund of the nomination filing fee. The candidate is still required to submit a financial statement covering the financial transactions made up to the point at which withdrawal is submitted. In addition, the candidate will be required to return any election material distributed to the candidate for election purposes. Only the names of certified candidates shall appear on the ballot. The candidates’ names shall appear in the format of first name then last name (e.g. John Doe), in alphabetical order, based on their surnames and in the case of identical surnames, their forenames. Middle initials shall not be used unless it is deemed necessary by the Clerk. If the candidate wishes and the Clerk agrees, another name that the candidate also uses may be used instead of, or in addition to, his or her legal name (e.g. Bill instead of William). No reference to a candidate’s occupation, degree, title, honour or decoration shall appear on the ballot. If the surnames of two or more candidates for an office are identical, or in the Clerk’s opinion so similar to cause possible confusion, every candidate’s qualifying address shall appear or heard under his or her name. If the number of candidates for the said office is the same or less than the number to be elected, the candidates will be declared as acclaimed on July 30, 2018 after 4:00 p.m. Resulting in one fewer candidate but no acclamation, the candidate’s name will be removed from the ballot if the voting period has not commenced. If the voting period has commenced, the Clerk shall cause notice of the candidate’s death or ineligibility on www.municipalityofkillarney.ca. The MEA provides that while an Elector is in a voting location (Voter Help Centre), no one shall attempt, directly or indirectly, to influence how the Elector votes. No campaign material, literature or advertising of any nature whatsoever of any candidate in the Election shall be displayed at, or within an election help centre or municipal facility, including parking lots. The premises are deemed to include the entire building and the property on which it is located, including the parking lot. Campaign material or literature of any nature found in this location will be removed immediately and disposed of without notice. The use of corporate municipal resources for election campaign purposes is strictly prohibited. All election candidates, including members of Council, are required to follow the provisions of the MEA, as amended, and ensure there is no use of town facilities, equipment, supplies, services, staff or other resources of the town for any election campaign or campaign related activities. No candidate shall undertake campaign-related activities on town property, leased or otherwise (e.g. parks, fire hall, recreation complex). Candidates are prohibited from using the Municipality of Killarney logos/corporate images, crest, photos, graphics or any other item of town intellectual property for any campaign-related purposes or material including, but not limited to, signs, printed and electronic publications, flyers, brochures, emails, website, business cards, postcards, letterheads, posters, and promotional items. Any disregard of this prohibition will be acted upon by The Corporation and could result in legal action. All candidate election campaign advertisements must be in compliance with the MEA at all times. A candidate must have filed their nomination paper before spending any money, and the amount they may spend on their campaign is regulated. The name, business address and telephone number of the individual who deals with the broadcaster or publisher under the direction of the candidate. 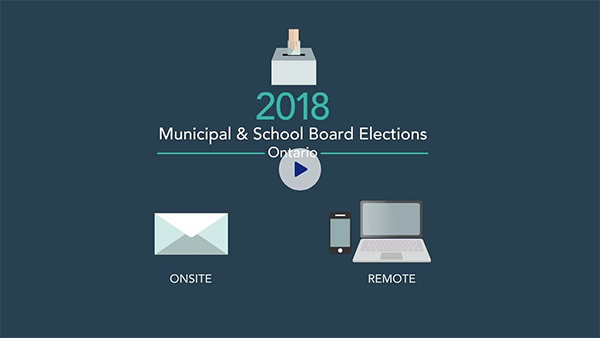 Information regarding election finances such as financial responsibilities of candidates, campaign contributions/fundraising, campaign expenses and financial reporting is available in the Ministry of Municipal Affairs 2018 Candidates’ Guide for Ontario Municipal and School Board Elections. This and other documentation can be found on the Ministry website at www.mah.gov.on.ca. After September 1, 2018, candidates will be provided access to the online Candidate Module where Voters’ List information will be available to search and view. Access will not be granted until the Candidate’s Declaration for Proper Use of the Voters’ List is executed and filed with the Clerk. The Voters’ List may only be used for election purposes. The candidates will be able to see which electors have participated in the election. Candidates will not be able to see how an elector has voted. Each Candidate may appoint, in writing on the prescribed form, person(s) to act as scrutineers to represent him or her during the election process. The appointment shall be made using the Appointment of Scrutineer by Candidate form as signed by the candidate. A person appointed as a scrutineer prior to being admitted to observe these election processes shall produce and show their appointment form and valid acceptable identification. The scrutineer will be issued an identification badge, which must be returned to the Clerk before leaving. All scrutineers must take and subscribe to an Oath of Secrecy. Not more than one candidate or one scrutineer representing each candidate may be in the Voter Help Centre at any time. Using cellular phones or other mobile devices in the Voter Help Centre. The Clerk is responsible for the conduct of the Election and no candidate or scrutineer has the right to interfere with an Election Official in the discharge of their duties. Any candidate, scrutineer, third party advertiser, agent or voter who by their actions creates a disturbance or interferes in any way with the proper conduct at the Voter Help Centre may be expelled from the location for such actions. An agent, candidate or scrutineer who is dissatisfied with the actions of election personnel is invited to contact the Clerk to discuss the matter. Candidates and/or scrutineers wishing to observe the final count must be at the Municipal Office prior to 8:00 p.m. on election night. No one will be admitted into the centre after 8:00 p.m. The role of scrutineers is very different using Internet/Telephone Voting and staff will provide candidates or their scrutineers the opportunity to participate as determined by the clerk, in order to gain confidence in the alternative voting method. The nomination period commences on May 1, 2018 for the 2018 Municipal Election, until the fourth Friday in July - Nomination Day - July 27, 2018. Nominations can be accepted by the Clerk during regular business office hours from May 1, 2018 up to the day preceding Nomination Day - July 26, 2018. On Nomination Day - July 27, 2018, the prescribed filing time is 9:00 a.m. to 2:00 p.m.
A person can only become a candidate during the Nomination Period. The Nomination Period starts on Tuesday May 1, 2018 and ends on Friday July 27, 2018 at 2:00 p.m. The time for close of Nominations will be confirmed using the clock located in the municipal office administration area. Nomination papers will not be accepted after the deadline. As Killarney has less than 4,000 electors, it is not a requirement that the candidate obtain 25 signatures from eligible electors. Nomination papers must be signed by the candidate and filed in person or by an agent (no fax or email). Tuesday May 1, 2018 through to Thursday July 26, 2018, Monday to Friday (statutory holidays excepted) between 9:00 a.m. to Noon and 1:00 p.m. to 4:00 p.m.
Friday July 27, 2018 (Nomination Day) between 9:00 a.m. and 2:00 p.m. On Nomination Day, candidates must make their presence known to the Clerk prior to 2:00 p.m. Nominations may be made by completing and filing in the office of the Clerk, nominations on the prescribed form and accompanied by acceptable identification (must be valid and contain the candidate's name, qualifying address, signature and Photo ID), the prescribed nomination filing fee ($200 for the Office of Mayor, $100 for all other offices), and such other documentation as required for the filing process. The filing fee is payable by cash, debit, credit card (Visa and Mastercard only), certified cheque, bank draft or money order payable to the Municipality of Killarney. If a greater number of candidates are certified than are required to fill the said office, there will be an election. If the number of nominations for an office is less than the number of candidates to be elected an additional Notice of Nomination will be advertised on the website only and additional nominations may be filed between 9:00 a.m. and 2:00 p.m. on the Wednesday following Nomination Day (August 1, 2018). The filing fee must accompany the nomination. The prescribed nomination fee is $200 for the head of council and $100 for all other offices. A candidate is entitled to receive a refund of the nomination filing fee if he or she files the documents under s.88.25(1) - the financial statements and auditors report, on or before 2:00 p.m. on the filing date. In the case of the 2018 regular election, the filing date is March 29, 2019 for the reporting period ending December 31, 2018. If a candidate wishes to withdraw completely, the candidate must file a written withdrawal of their candidacy, by no later than 2:00 p.m. on July 27, 2018 (Nomination Day) in the Clerk's Office and provide a copy of Photo ID. Any withdrawals sent by mail, email or fax are not permitted, as it must be filed in the Clerk's Office. Prior to 4:00 p.m. on the Monday following Nomination Day - July 30, 2018, the Clerk shall examine each nomination filed and if satisfied the person is qualified to be nominated and that the nomination complies with the Act, the Clerk shall certify as such on the nomination filed. If not satisfied, the Clerk shall reject the nomination and as soon as possible, give notice to the person who sought to be nominated and all other candidates for that office. The necessary financial disclosure was not filed for the previous election or any by-election in which the individual may have been a candidate. Information regarding the 2018 Candidates for Municipal Election will be posted here as they file their candidacy papers. To run for an office on Council, a candidate must be qualified on the day they file the Nomination Paper. It is the responsibility of the candidate to ensure they meet all of the qualifications and file proper nomination papers, prior to 2:00 p.m. on July 27, 2018. Candidates and Third Party Advertisers should pay careful attention to campaign finance rules and may wish to seek professional advice. The MEA assigns several duties to Candidates and registered Third Party Advertisers respecting contributions, receipts, records, financial filings, return of contributions, anonymous donations and other matters. Candidates and Third Party Advertisers should familiarize themselves with their duties and obtain professional assistance if required. Contributions cannot be accepted outside the campaign period (beginning upon nomination or registration and ending December 31, 2018). A campaign period may be extended as set out in subsection 88.24(4) of the MEA. Upon filing of Nomination papers or Registration, candidates and third party advertisers will receive an estimate of campaign spending limits using the number of electors for each respective office as it existed on nomination day of the previous election (September 12, 2014). No later than September 25, 2018, the Clerk shall provide each candidate and third party advertiser, via email, with a Certificate of Maximum Campaign Spending Limits that can be incurred using the number of electors for each respective office as it exists on September 15, 2018. Office Maximum Campaign Expenses Spending Limits Maximum Amount of Contributions Own Campaign Maximum Amount of Expenses for Parties, etc. The higher of the calculation between the Estimate and the Maximum shall be the final spending limit. no charge political advertising provided equally to all candidates for an office in accordance with the Broadcasting Act (Canada). a total of $5,000 to two or more Candidates or Third Party Advertisers nominated or registered in the Town. Candidates and Third Party Advertisers shall not take contributions more than the amount set out in the Certificate of Maximum Campaign Amount. The Clerk shall provide notice of all of the filing requirements at least 30 days before the filing date. All candidates and third party advertisers are required to file a financial statement using the prescribed form. Electronic submissions will not be accepted. A Notice of Default will be given to any Candidate or Third Party Advertiser if the Financial Statement is not submitted by the deadline. The financial statements shall be available for viewing by the public on www.municipalityofkillarney.ca. By March 29, 2019, all candidates and Third Party Advertisers are required to file a financial statement with the Clerk using the prescribed form. Electronic submissions will not be accepted. There are penalty provisions in the MEA that are applicable to candidates who fail to meet the disclosure and reporting requirements. If a candidate fails to pay over a surplus to the Clerk or exceeds their election spending limit, they forfeit any office they have been elected to and are ineligible to run for, or to be appointed to any office in Ontario until the next regular election. A candidate will be permitted to resubmit a financial statement to correct an error, until the filing deadline. The nomination filing fee will only be refunded if a financial statement is filed on time. If a candidate doesn’t file their financial statement on time and is willing to pay a $500 late filing fee, the candidate will be provided an additional 30 day grace period to file the financial statement. A candidate exercising this option will not be refunded their nomination filing fee. In accordance with the MEA, the Clerk shall, before Voting Day, notify all candidates of the penalties under subsection 88.23 (2) and 92(1) related to election campaign finances. (2:00 p.m. on Friday July 27, 2018). No person shall locate a sign in such a manner as to obstruct, impair or impede the view of any lane, street, highway intersection, regulatory sign, traffic signal or railway crossing. If in contravention with any of the above, the sign will be removed to the Public Works Facility where it can be retrieved by the owner or organization. The responsibility for authorized placement of signs rests with the candidate. Please reference the MTO Corridor Signing Policy for more detailed information regarding placing election campaign signs on Provincial properties. With respect to matters of policy and procedures for alternative voting methods and all other municipal election matters, the decision of the Clerk is final. The contents of the Policies and Procedures document are intended only as a guide to certain provisions of relevant legislation and do not purport to recite all applicable statutory references. Prospective candidates must satisfy themselves through their own determination that they have complied with the pertinent sections of the Municipal Elections Act (MEA) and that they are in fact qualified by law to seek elected office. The secrecy and confidentiality of the individual vote is paramount. The election should be fair and non-biased. The election should be accessible to the voters. The integrity of the process should be maintained throughout the election. There be certainty that the results of the election reflect the votes cast. Voters and candidates should be treated fairly and consistently within a municipality. Assist the Clerk and other Election Officials as required. The Clerk may provide for any matter or procedure that is not otherwise provided for in an Act or regulation and, in the Clerk’s opinion, is necessary or desirable for conducting the election. The Clerk at any time has the right to amend this document to facilitate the voting process and security. The Clerk’s ruling on any interpretation of this document is final. The official election website www.municipalityofkillarney.ca will be the main place for election information and updates for the media, candidates, third party advertisers, voters and the public. The Clerk shall give notice of the election (if one is required) as soon after Nomination Day as possible which will include a list those candidates with certified nominations for each office. All Election Officials shall take an oath of secrecy and be appointed by the Clerk as per the Appointment and Oath of Election Official. Complaints regarding any and/or all breaches of secrecy shall be documented by the Election Official as well as questions and answers of the complainant and, if deemed appropriate, the Clerk shall submit same to the Police for further investigation and prosecution. Procedures and forms will be provided in English only. The Clerk will be required to review all of the financial statements received and identify whether any contributor appears to have exceeded any of the contribution limits. The Clerk will be required to report to the Compliance Audit Committee as soon as possible after the filing deadline regarding contributions made to candidates and third party advertisers in excess of the established limits. Within 30 days of receiving the report, the Compliance Audit Committee must consider the report and decide whether to commence a legal proceeding against a contributor for an apparent contravention. As soon as possible after April 30, 2019, the Clerk is required to provide a report and make it available on the municipal website setting out all candidates in an election and indicate whether each candidate complied with the financial reporting requirements. After one-hundred and twenty (120) days from declaring the results of the election (subject to a Judge’s order or recount proceedings), the Clerk shall authorize the destruction of the applicable election records and be provided with written confirmation. The Clerk may also destroy all other documents and materials related to the election, except those specified under the Act (e.g. financial statements filed by candidates). A declaration stating their destruction will be taken and retained on file. The Clerk, at 8:00 p.m. on October 22, 2018 shall arrange for the close and deactivation of the voting system. The Clerk shall then produce the results report. The Clerk and another Election Official shall sign the report, indicating the unofficial results and votes cast. Where an electors’ request have been granted by the Superior Court of Justice. In accordance with the MEA, a recount shall be conducted in the same manner as the original count. Only a judge may provide that a recount be held in a different manner than the original count.